Lately I have been working on setting up a Cisco CRS (16 Slot) Multi Chassis 2+1 system for one of my customers (a leading Service Provider in EMEAR). The activities lasted roughly a week, full of activities and challenges at the same time. As you we already know the Cisco Carrier Routing System can be set-up to work in a Single mode (Single Chassis) or Multi system mode (Multi chassis). 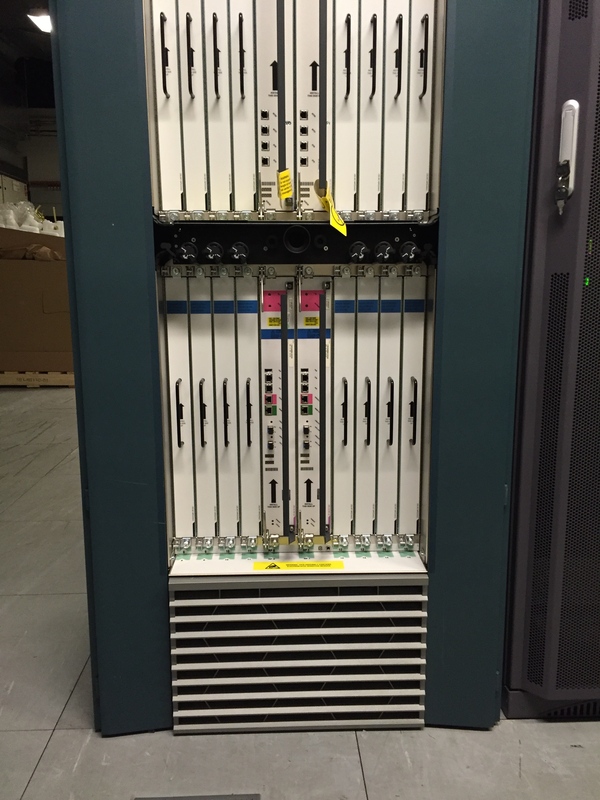 Benefits of running a Multi Chassis system is purely on Scalability and Capacity. The list above summarizes most of the components needed to build up a CRS Multi Chassis system. FCC – the Fabric Chassis is where all the Fabric Cards (S2) is placed, whereas the S13 Fabric Cards are placed to the Line Card Chassis. The most important thing to remember is that all the S13 cards from the LCC are connected to the S2 cards via the Array Cables. So, one chassis (in a 2+1 scenario) is used for the Fabric Card placement, and two additional Chassis will be used for the Line Card placement, improving the scalability as well as capacity of packet forwarding. Don’t forget, a FCC differs from a LCC physically, so both of them have different PID’s when purchasing. S2 Fabric Cards – are placed on the FCC, same as in the LCC here we need eight S2 fabric cards in a 2+1 scenario that connects to S13 cards of both LCC’s in the topology via the OIM modules on the rear of the FCC. 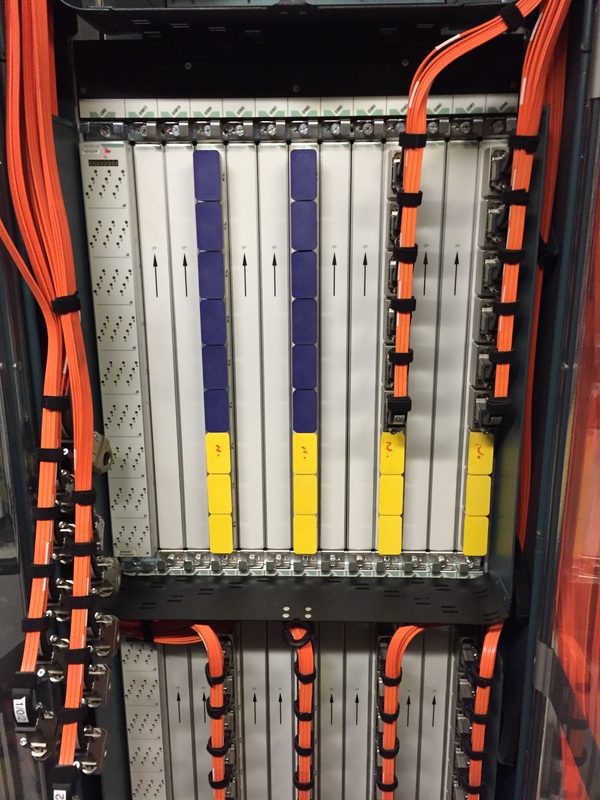 Each S2 card has a 1to1 connection to an OIM module that is placed in the rear of FCC, and each OIM modules has 9 Fiber Optical Bundle Ports. 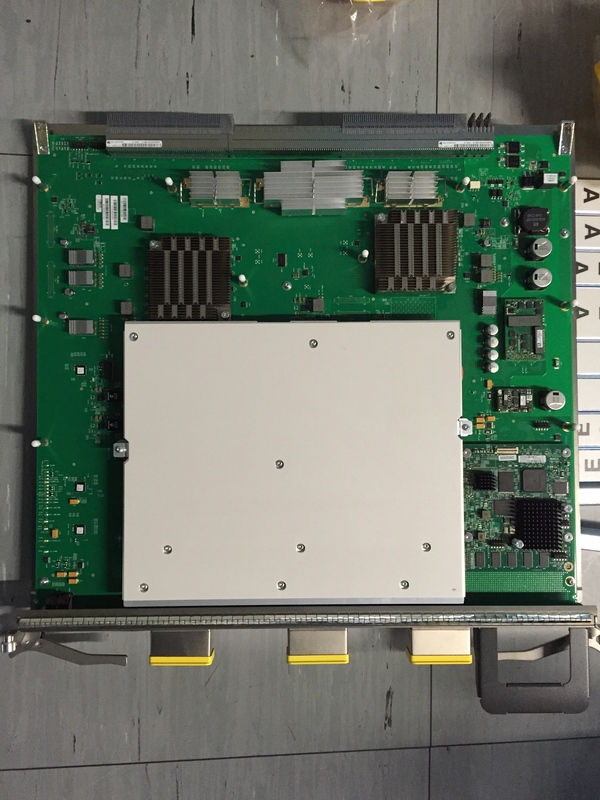 Optical Interface Modules – are basically passive cards interconnecting the Array cables on the FCC, the OIM’s are installed on the rear of the FCC chassis. They are directly connected to a S2 Fabric Card’s that are placed in the front of a FCC. There is no intelligence being used on the OIM’s. 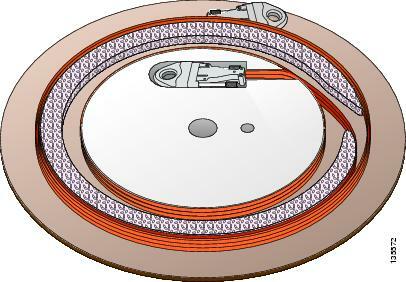 For more information on Fabric Cabling please check following link. SCGE card – are installed on the FCC, 2 of these cards are needed for redundancy purposes, where one is active and the other one acts as a standby. One SCGE card is placed on the right most slot on the upper side of the shelf, whereas the second SCGE card is installed on the exact same slot on the lower part of the shelf. These cards are mainly used for control and management of the chassis; failure to start and boot-up correctly of SCGE cards causes the whole chassis to not power on. On a Fabric Card Chassis always install physically the OIM modules first on the rear of the chassis, and then install the corresponding Fabric Card on the exact same slot from the front side. Install the OIM Led Module on the correct slot before installing the SCGE card. Start the Fabric cabling (I might have a new blog-post regarding the fabric cabling) between LCC and FCC, take care when moving and rolling the Array Cables, they are very sensitive, and follow the cabling scheme, since it is very important to have proper fabric cabling in place. 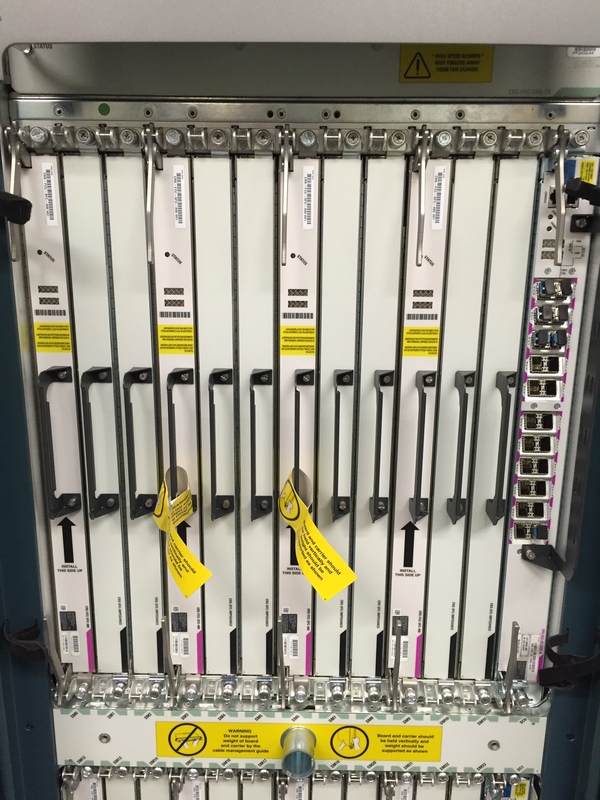 The serial numbers configured above are the serial numbers of each chassis (LCC0, LCC1 and FCC). And the fabric plane configuration mostly is a standard one. With the above configuration on the LCC0 you should be ready to power on the FCC (considering that Fabric Cabling and RP to SCGE card cabling is in place) and the FCC should be able to recognize the LCC0. After FCC and LCC0 recognize themselves as part of the Multi-chassis you can power on the second Line Card Chassis (LCC1).